The murmurs have steadily grown to whispers. These whispers have lead to clandestine meetings in secretive venues across Europe. Representatives from the biggest football clubs on the continent have increasingly met and discussed a new project which would likely see the biggest shake up of football in modern times. They have been discussing the now very real prospect of forming a break away, separate league containing the elite clubs from Europe’s best leagues. The increasing spending power of the Premier League, coupled with the huge wealth of American sports clubs has seen more than just curious glances from Spain, Italy, Germany and France. In an increasingly global game it seems almost inevitable that the rift between the rich and the rest will eventually tear off altogether. It may take time, but the ingredients are already in place for the break up in Europe. Traditionalists of all walks of life would fight tooth and nail, any proposed break away. Ultimately though, their emotional pleas for tradition will not show up on a balance sheet. The money men of the game will no doubt look to potentially lucrative opportunities of opening up their football brands to the world in a way that simply wasn’t possible until the past two decades. One only need a glance at the current Forbes rich list to see the global appeal of American sports. Of the ten richest Sports clubs in the world only Manchester United, Barcelona and Real Madrid are present and correct as of 2018, according to Forbes. The fact that the American sports clubs are so far advanced in their wealth, despite their much smaller target audience, is no longer a surprise to most people who understand the mechanics of brand building. Increasingly these people have found their way into European football clubs and will know all about the potential for growth, and there are plenty of lessons to be learnt across the Atlantic. When the notion of a thirty-ninth Premier League game to be held outside the confines of the England was tabled a decade ago, many recoiled in horror. It was a surely an insult to the paying fans to suggest it. It smacked of the game selling its soul to the highest bidder. We’ll come to that later. For NFL teams though there were no such qualms. 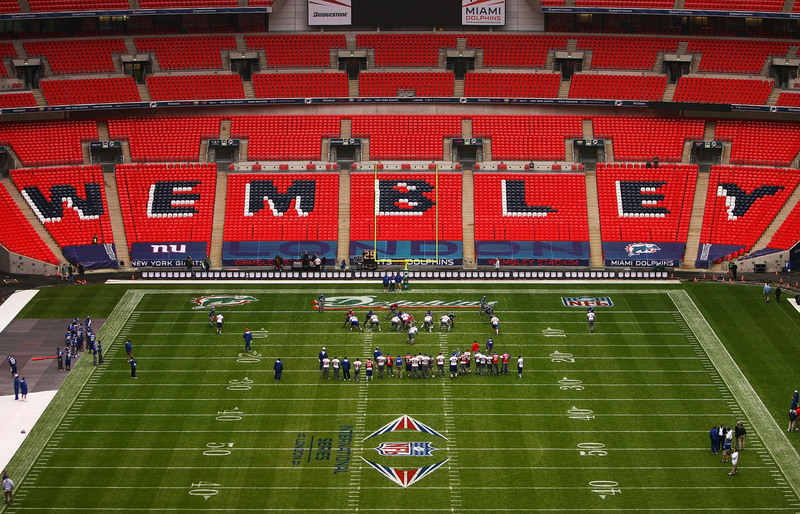 They had already begun their European brand building with trips to Wembley beginning as early as 2007 when the New York Giants faced off against the Miami Dolphins in front of 81,176 fans. Since then, twenty-seven different NFL sides have played in increasing numbers of fixtures in England and Mexico. The International Series is set to expand with Germany and China seen as potential markets. These games are not exhibition matches either, they are competitive fixtures aimed at the club’s foreign support base. As the NFL has grown and become more global, no doubt these foreign fixtures and the spectacles put on at the giant stadia exhibiting the games, has helped to grow the wealth of the clubs involved. The Americans are not squeamish about their brand building and money spinning projects. Their franchise system has also grown supporter networks across their vast continent, further boosting their reach and wealth. In 2017, the Dallas Cowboys brand’s was worth $900 million dollars to the franchise and four of the top five NFL shirts were embossed with their player’s numbers. These are staggering numbers and demonstrate the strength of one massively lucrative brand. Now it would be foolish to suggest that Europe clubs could pull out a world map and simply point their fingers at their next prospective venue in a hypothetical super league. There are logistical issues to consider. Furthermore some of the potential markets such as Africa and Asia-Pacific are much poorer than the middle class spending hubs of Europe, America and parts of the Middle East. However, the potential financial rewards of Manchester United playing Real Madrid competitively in China in front of a hundred thousand fans must be mouth watering for the punters. Of course, there would still have to be plenty of home games to keep local support going, but if the restrictive confines of a domestic league were to be broken, it would open up plenty of bountiful opportunities. You only need to look at some of the pre-season tour attendances for tangible proof that the allure and demand is there for the foreign contingents of the European club’s support base. In 2013, Liverpool played Melbourne Victory in front of a staggering 95,000 capacity crowd. When Barcelona came to Wembley to play Liverpool in a 2016 friendly, the 89,845 attendance was the second largest at the most recent incarnation of the famous venue. There is clearly demand, and money to be made from potential clashes staged away from the traditional venues. With domestic set ups offering more restrictive, lower gates against an increasingly non-competitive framework, some of Europe’s leagues simply don’t have the same appeal anymore. In recent decades, the dominance of the big domestic leagues by Europe’s elite has created a closed shop for many, ceiling the big boys off financially from the other teams. In Germany, Bayern Munich have been league Champions six times in six years. In Italy, nobody has been able to break Juventus’ hold on the title for the past seven years. Atletico Madrid’s break in to the duopoly of Barcelona and Real Madrid was most welcome, but has done little for the rest of the sides in that league. As this void has widened, so too has the finical gap, with most other teams in the respective leagues. The other teams are unable to compete with their wealthy rivals and have almost feeder clubs, trying to stave off relegation. Ultimately the big leagues have suffered from a monotonous predictability which has stifled competition. In England, Manchester City risk pulling away from the rest, as they dominated the Premier League last season, leaving the other big five clubs jostling for places. Barcelona have lost just thirteen domestic league matches since 2014/15, it’s a similar story in France, where PSG have lost just twelve domestic games in the same period. The point is, that the current domestic framework is not only not offering enough financial incentive on the continent, but also failing to put forward a competitive season of fixtures for Europe’s big clubs. Unless there is drastic change, the situation is likely to continue stagnating for those not lucky enough to be in the elite group of teams at the top of the tree. Perhaps the biggest barrier Europe’s elite would face is the current wealth of the Premier League. 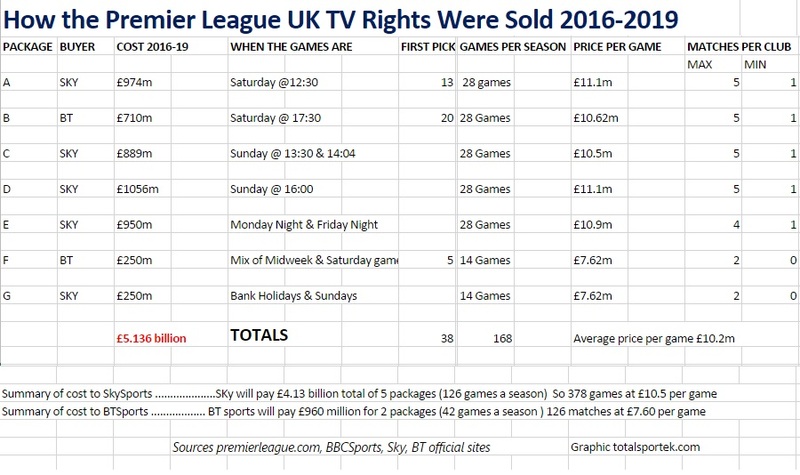 The massive surge in the league’s TV rights money has seen English club’s wealth and spending power skyrocket. £5.136bn is current cost of the Premier League rights for 2016-19, that’s a 71% increase on the previous period. West Brom, who finished 20th and suffered relegation, received £94,666,491 for their toil. For a quick comparison, the average Italian club earns just over fifty million euros in TV money. This is quite a hefty roadblock for any potential European Super League. Why would the elite of English club football want to pull of such a lucrative deal any time soon? Yes the possibility of a broadened framework, with a chance to reach their global fan bases more often is enticing, but matchday revenues are still dwarfed by TV income for Premier League teams. For example in 16/17, of Liverpool’s 424 million euro income, just 80.1 million was generated from the matchday revenue stream. The chance to spread the brand and earn extra pennies from big matchday events abroad would have to be joined by a considerable TV rights package in order for the project to be taken seriously by the top six in England. No doubt there would be plenty of interest in bidding for right’s packages, but of hostility and low attendances hurt the initial project, then it might find itself struggling for investors. Petitions were signed and large figureheads such as Rick Parry were said to be against the idea altogether. The project itself was very similar to the NFL International series model and aimed at lucrative football markets in Asia, and America. A projected income of £40-£80 million was offered as a carrot Premier League chairmen. Scudamore quipped to The Daily Telegraph in 2008. The now Executive Chairman of the Premier League was said to be hugely enthusiastic about his labour of love as he attempted to drum up interest throughout 2008. Ultimately though the project fell down as a combination of scepticism and emotional pleas to not sell the soul of the working man’s game became almost deafening. This ardent opposition is likely to resurface, should the integrity of the English game come under fire once more. However, in recent years there have been signs of change as a groundswell of anger at matchday prices has seen a string of protests across the game. These have varied in size and significance. In early 2016, 10,000 Liverpool fans stormed out of Anfield on seventy-seven minutes in protest at the clubs proposed £77 matchday tickets. This prompted the plans for the price increase to be shelved by the club’s owners. Perhaps more significant protest movements have seen fans of England’s traditionally bigger clubs brake off and form new clubs in the lower reaches. Movements like FC United of Manchester and AFC Liverpool were formed in the past decade and have seen moderate growth of attendances and success. These protests could be seen as symptoms of the local fan bases’ awareness of the shifting sands at their clubs. Yes they will always be the heart and soul, providing the atmosphere and genuine love for their clubs, but they have seen their stomping grounds usurped by globalization and an increasingly middle class supporter base. Reaction to a potential European super League is still likely to be hostile. However this could manifest itself in more protest clubs forming and local fans staying away in larger numbers, as they acknowledge a futile fight against the inevitable. Ultimately, these clandestine meetings involving board members of some of the continent’s biggest football clubs are not going to go away. 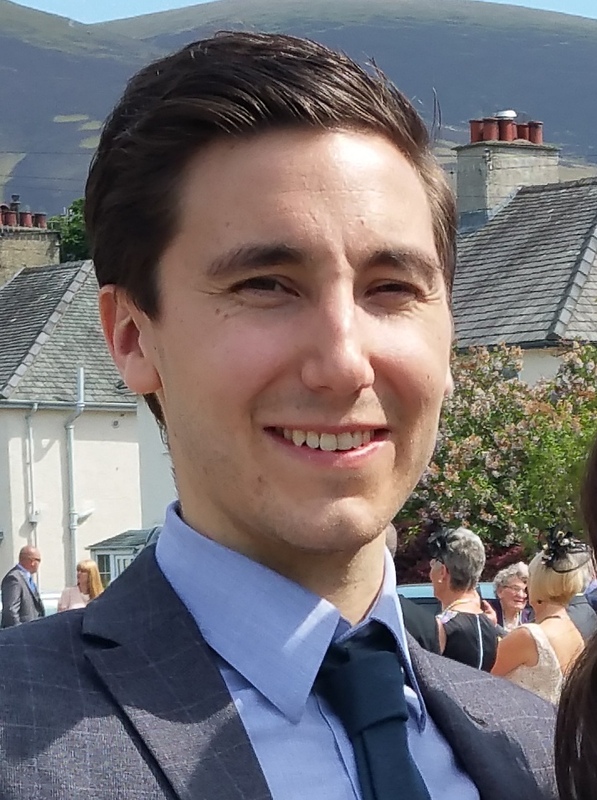 Yes their grand ambitions of a breaking away and forming a continent spanning super league will cause seismic rifts in football, but they will continue to force ahead with their plans nonetheless. There is likely to be a pitched battle between UEFA and FIFA, as to the mechanics of such a competition. There is also the not insignificant matter of what would happen to the remaining clubs. Would they be better off without the big teams? Yes the prize money would be reduced, but it might free up some of the traditionally bigger clubs in Europe to be competitive once again. The urge for wealth and financial growth is strong amongst Europe’s elite clubs. They will no doubt look at the coffers of the American sports clubs with envious eyes. Can the current, restrictive frameworks of the traditional European Leagues survive this onslaught? Only time will tell, but ultimately the money men will be likely be very persuasive and find a receptive audience amongst Europe’s super power football clubs.